Introducing three new hybrids, selected for their bolder colours and resistance to common cabbage tree ailments. Spring 2003 will see the introduction of three new hybrids of the New Zealand cabbage tree, Cordyline australis. These hybrids were selected for their bolder colours and resistance to common cabbage tree ailments. 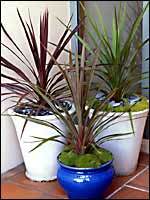 The are happy in both sun or shade, planted in the garden, or in pots and containers. Cordyline 'Peko'  An attractive new hybrid with striking rich lime-green leaves. Each leaf has a bright pink stripe at its base where it joins the trunk. Cordyline 'Red Star'  A new variety with dark purple/red strappy, flax-like foliage. It looks like a cross between Cordyline 'Purple Towers' and Cordyline 'Red Fountain'. The deep velvet red leaves have a tropical look about them, which adds to their all year round appeal. Cordyline 'Sun Dance'  This hybrid's main feature is its stunning multi-coloured red and green striped leaves. It has a very tight and compact habit and its tropical palm like foliage can be used to soften the hard edges in the garden. Once planted in either pots or in the garden you can expect this plant to triple in size over the next two to three years. The cordylines released this spring are approximately 18 months to 2 years old. As they mature they will develop a bare trunk up to 3 metres tall and 60 centimetres in diameter. An annual application of general garden fertiliser and an application of bark mulch is recommended to maintain plant health. In areas which have heavy frosts, tie up the leaves in winter when plants are young.